Guess The Emoji is a simple game where you will see some emojis and you will need to guess what they mean. It could be anything, from a famous person to proverbs, movies or quotes. 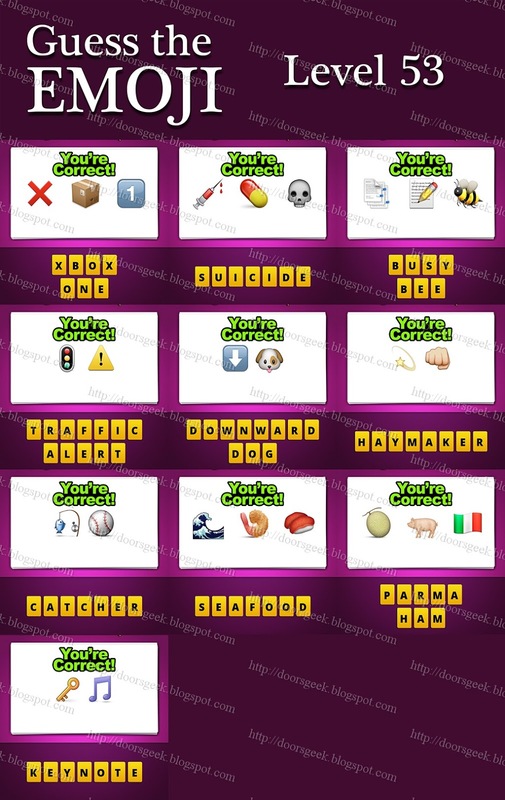 If you are stuck in Level 58 and you are looking for an answer to one of the emoji you will find the correct ones here. Newton - the red apple emoji, a white arrow pointing down, the face of a man with a black mustache and a white telescope. Hit and Run - the red car emoji, a explosion, a blue car and a running man emoji. Dead Sea Scroll - the grey skull emoji, a blue water wave and a old scroll emoji. Deviled Eggs - the purple devil head and a black frying pan with an egg inside. Star Trek - the yellow star emoji and two red foot prints. Kopi Luwak - the yellow cat head follow by a brown poo, a white arrow and a white cup of coffee. Moses - the man with black mustache followed by two hands with 4 blue triangles above and two water waves emoji. Thirsty - the tongue emoji and 3 blue water drops. Lick - a tongue and a lollipop emoji. Latte - the black and white cow emoji and a white cup of coffee. Guess The Emoji Level 58 Answers, Cheats, Solution for Android, iPhone, iPad. Guess The Emoji is a simple game where you will see some emojis and you will need to guess what they mean. It could be anything, from a famous person to proverbs, movies or quotes. 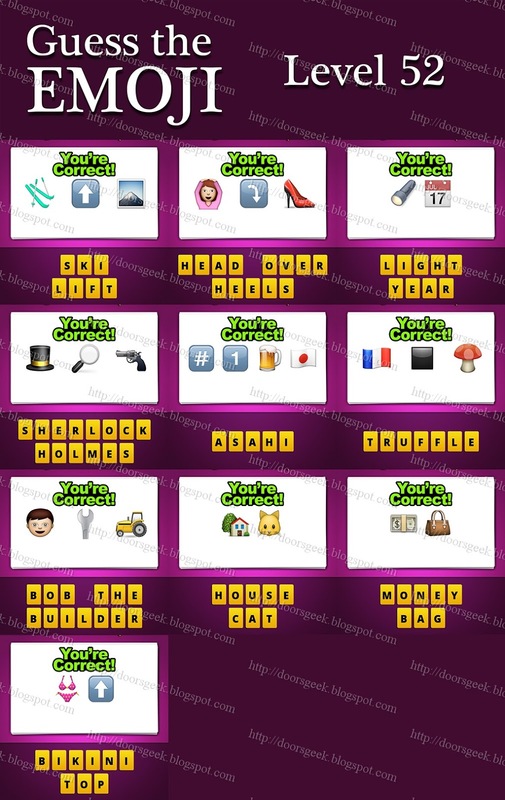 If you are stuck in Level 57 and you are looking for an answer to one of the emoji you will find the correct ones here. Postal Service - the blue mailbox emoji and the face of a police man. Root Beer - the branch with 5 green leafs emoji and a mug of beer. Lightning Fast - the yellow thunder followed by a running man and a smoke cloud. Centaur - the man face with a black mustache, a black "+" sign and the head of a horse. Sleepy Head - the 3 blue zzz followed by a sleeping yellow face and a boy with 4 blue triangles above his head. Jackie Chan - the red flag with 5 yellow stars in it, followed by a fist, a black video camera emoji and a yellow star. Save the Date - the black diskette emoji and a red calendar. First Love - the white 1 inside a blue square and a red heart emoji. Le Coq Sportif - the french flag emoji and a white chicken head. Morning Coffee - the picture with the sun and two black mountains and a white cup of coffee/tea emoji. Guess The Emoji Level 57 Answers, Cheats, Solution for Android, iPhone, iPad. Guess The Emoji is a simple game where you will see some emojis and you will need to guess what they mean. It could be anything, from a famous person to proverbs, movies or quotes. 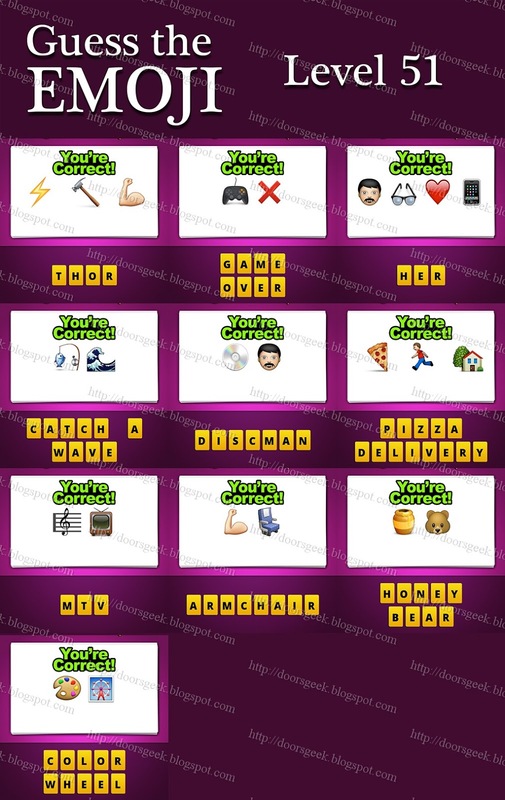 If you are stuck in Level 56 and you are looking for an answer to one of the emoji you will find the correct ones here. Radio Station - the old brown radio followed by a sigh colored in red, white, blue. Sleep Walking - the sleeping yellow emoji and a man that is walking. Matrix - the red circle emoji followed by the word "VS", a blue circle and a red-yellow pill. Water Proof - the red banned sign followed by 3 blue water drops. Hugs and Kisses - the red emojies "XOXO". Atomic Bomb - the white "A" in a red square and a black bomb emoji. Keyring - the golden key emoji and a silver ring. Drug Money - the red-yellow pill and a pile of money. High Tide - the yellow half moon emoji, a blue square with an white arrow inside, pointing up, and a blue water wave. Bell Bottom - the golden bell emoji and a pair of blue pants. Guess The Emoji Level 56 Answers, Cheats, Solution for Android, iPhone, iPad. Guess The Emoji is a simple game where you will see some emojis and you will need to guess what they mean. It could be anything, from a famous person to proverbs, movies or quotes. 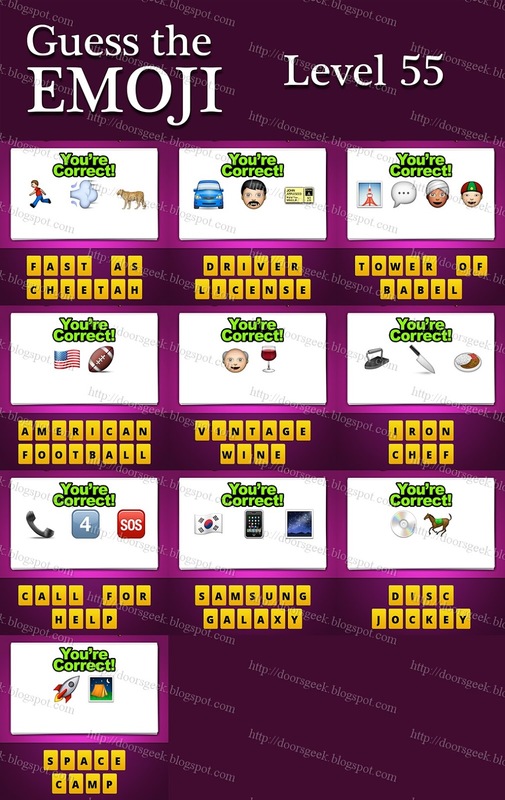 If you are stuck in Level 55 and you are looking for an answer to one of the emoji you will find the correct ones here. Fast as Cheetah - the running man emoji followed by a white smoke cloud and a tiger/leopard. Driver License - the blue car emoji, a face of a man with black mustache and a yellow driving license. Tower of Babel - the red tower emoji followed by a white speech bubble, a man with a towel on his head and another boy with a red-green hat. American Football - the flag of america emoji and a brown football ball. Vintage Wine - the bald old man emoji and a glass of red wine. Iron Chef - the old black iron emoji followed by a knife and a plate of food. Call for Help - the black phone speaker followed by a white "4" and a the word "SOS". Samsung Galaxy - the white flag that has a blue-red circle inside, followed by a smartphone and a picture of the night sky. Disc Jockey - the CD emoji and a running horse. Space Camp - the white rocket emoji and a picture with a night landscape and a orange tent. Guess The Emoji Level 55 Answers, Cheats, Solution for Android, iPhone, iPad. Guess The Emoji is a simple game where you will see some emojis and you will need to guess what they mean. It could be anything, from a famous person to proverbs, movies or quotes. 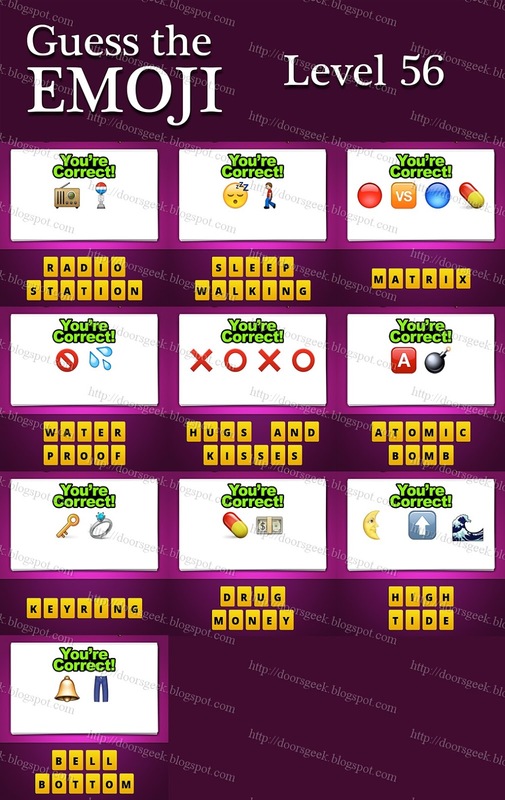 If you are stuck in Level 54 and you are looking for an answer to one of the emoji you will find the correct ones here. Bulldozer - the cow/bull emoji and a yellow tractor. Mermaid - the woman face a black plus sign and a blue fish emoji. Thunder Buddies - the yellow thunder and two boys holding hands. Killer Whale - a black square emoji followed by a white square emoji and a blue wale. Titanic - a picture with a ship inside followed by a blue water wave and a explosion emoji. Hot Bath - the yellow fire emoji and a white bathtub. Family Ties - the parents with their son emoji followed by two blue shits with orange ties. Free Balling - the white word "FREE" followed by a soccer ball emoji, a woman wearing a pink shirt and having her hands crossed, and the final emoji is a pink woman swimming suit. Strongbow - the arm emoji and a pink bow. Hashtag - the white "#" inside a blue square and a white tag with a red cord. Guess The Emoji Level 54 Answers, Cheats, Solution for Android, iPhone, iPad. Guess The Emoji is a simple game where you will see some emojis and you will need to guess what they mean. It could be anything, from a famous person to proverbs, movies or quotes. 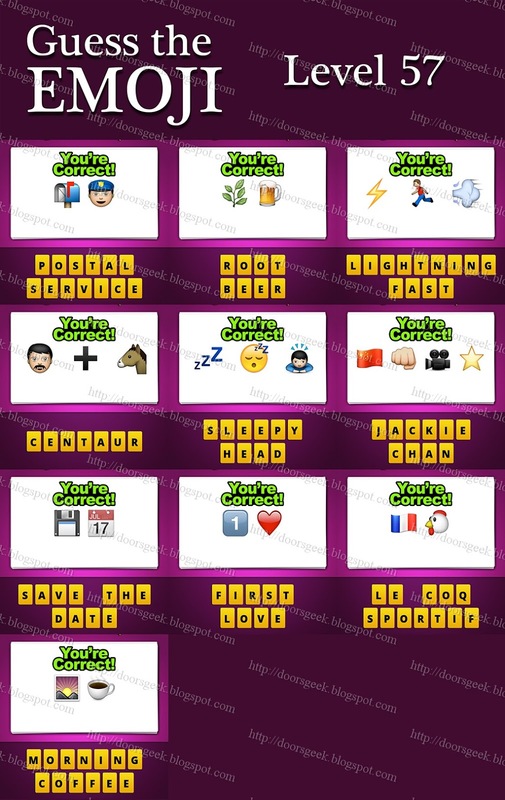 If you are stuck in Level 53 and you are looking for an answer to one of the emoji you will find the correct ones here. Xbox One - the red "x" emoji followed by a box and a white "1" in a blue square. Suicide - the bloody syringe emoji followed by a red-yellow pill and a grey skull. Busy Bee - the 3 white paper emoji followed by another paper with a yellow pencil above and a bee. Traffic Alert - the traffic lights emoji and a yellow triangle with a "!" inside. Downward Dog - the blue square that has a white arrow inside, pointing down, and a puppy head. Haymaker - the circle yellow star emoji and a fist. Catcher - the trapped blue fish and a baseball ball. Seafood - the blue water wave emoji followed by a shrimp and two red things. Para Ham - the green fruit emoji followed by a pig emoji and the flag of Italy. Keynote - the golden key emoji and a purple music note. Guess The Emoji Level 53 Answers, Cheats, Solution for Android, iPhone, iPad. Guess The Emoji is a simple game where you will see some emojis and you will need to guess what they mean. It could be anything, from a famous person to proverbs, movies or quotes. 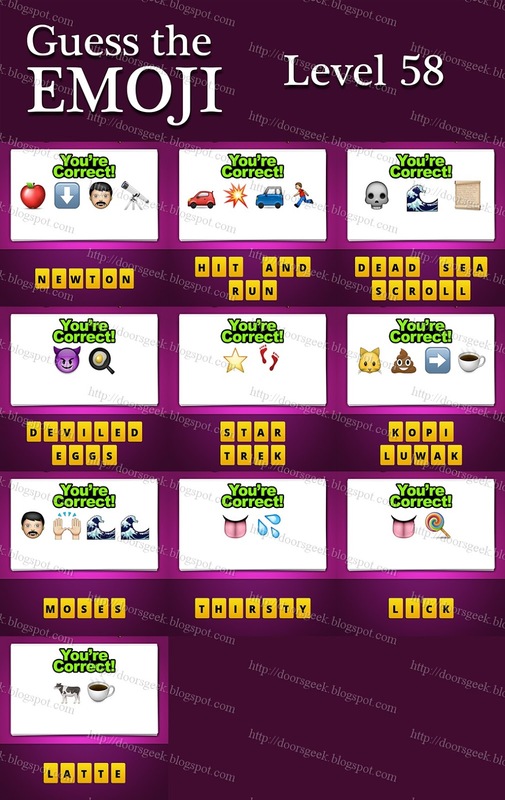 If you are stuck in Level 52 and you are looking for an answer to one of the emoji you will find the correct ones here. Ski Lift - the green skiing kit followed by a white arrow pointing up and a picture with a mountain inside. Head Over Heels - the girl dressed in pink and with her head above the head followed by a curved white arrow and a red shoe. Light year - the black flashlight emoji and a red calendar page showing the date 17-Jul. Sherlock Holmes - the black topper hat emoji followed by a magnifier and a gun emoji. Asahi - the "#" emoji followed by a white "1", a mug of beer and a white flag with a red circle in the middle. Truffle - the flag of France followed by a black square emoji and a red mushroom. Bob the Builder - the boy face emoji followed by a silver wrench and a yellow tractor. House Cat - the white house emoji and a yellow cat head. Money Bag - the pack of money emoji and a brown hand bag. Bikini Top - the pink swimming suit and a white arrow emoji pointing UP. Guess The Emoji Level 52 Answers, Cheats, Solution for Android, iPhone, iPad. Guess The Emoji is a simple game where you will see some emojis and you will need to guess what they mean. It could be anything, from a famous person to proverbs, movies or quotes. 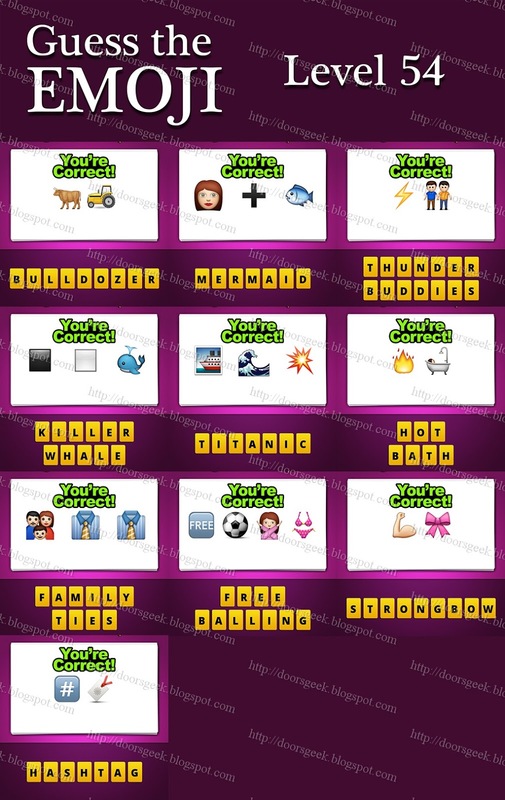 If you are stuck in Level 51 and you are looking for an answer to one of the emoji you will find the correct ones here. Thor - the yellow lightning emoji followed by a hammer emoji and a arm. Game Over - the black joystick/controller emoji and a red "x". Her - the face of man with black mustache followed by a pair of glasses emoji, a red heart and a smartphone. Catch A Wave - the blue fish caught in a fishing pole and a water wave emoji. Discman - the CD emoji and the face of a man with black hair. Pizza Delivery - the pizza slice emoji followed by a running man emoji and a white house. MTV - the key soil emoji and a old TV. Armchair - the arm emoji and a blue chair. Honey Bear - the golden jar emoji and the head of a brown bear. Color Wheel - the painting color palette and a picture with a red carnival wheel inside. Guess The Emoji Level 51 Answers, Cheats, Solution for Android, iPhone, iPad.